San Gimignano to Siena - one day cycling through Tuscany! Pick up: 8.30 a.m. Drop off: 5.30 p.m.
A journey to three beautiful medieval towns in Tuscany. Head into the marvelous landscape of Chianti between San Gimignano and Siena with a one-day biking tour. Visit towns, vineyards, and Tuscany the way it was meant to be seen, slow and easy! Our exclusive San Gimignano to Siena Biking Tour is going to transport you back in time with three special stops from Tuscany’s medieval past. It will be a thrilling excursion that combines cycling, history, wine tasting, and sightseeing. -> Families with young kids. This safe itinerary can be modify for those travelling with children under 12 y.o. Please let us know at the time of booking. 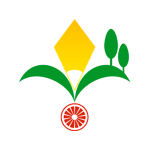 We will arrange for your pick-up at, or very near, your hotel in Florence. With our air-conditioned shuttle, we head first to San Gimignano for an early morning visit (before the throngs of tourists arrive) to this UNESCO World Heritage Site with free time to walk around the city walls. The pedaling starts downhill from here, where we will follow some of the most beautiful, and absolutely tranquil, back-roads. We start off using panoramic pieces of the famous “Via Francigena” which, in the Middle Ages, was used by pilgrims making their trek towards Rome for a blessing from the Pope. You too get to be a “Pilgrim for a day“, following their footsteps, and in many cases gaze upon the same untouched landscape that they too saw as they moved further south. The typical white roads will guide us through vineyards, and sunflower fields with a few surprises along the way. 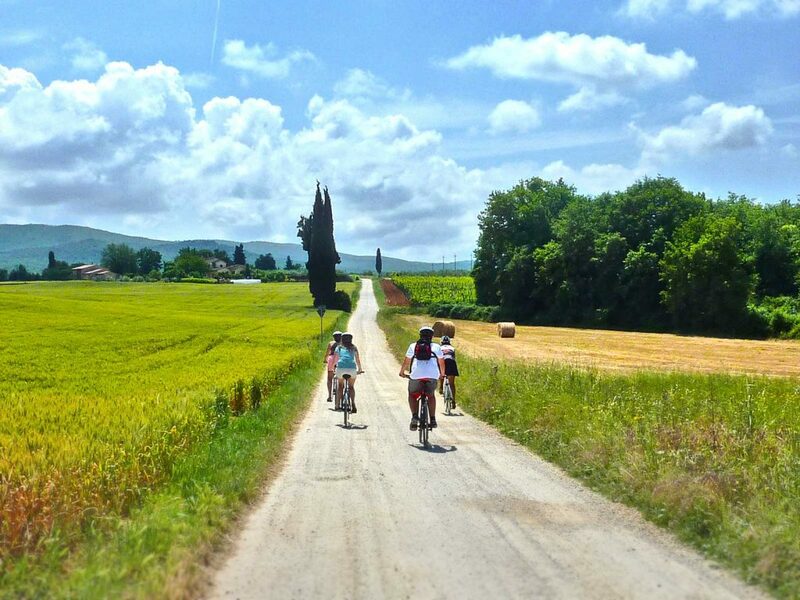 Biking at your own pace following gentle, soft rolling hills famous for their beauty, we will head to Monteriggioni. A stop to this village is mandatory! The castle, almost untouched by time, the church, the square walls, and the small specialty shops are just asking for photos! Ready for sipping some delicious Chianti wine? Then this is the right place for you! After a gelato or wine stop, we will head for Siena on a gently curving road, through the typical Tuscan landscape with churches, castles, villages and beautiful fields. We will deliver you to the ancient walls of Siena – another UNESCO World Heritage Site – in the early afternoon, with just the right amount of time for a light lunch. Spend your free time strolling the cobbled stone roads and amazing architecture in the city of the Palio and — why not? — have a delicious gelato downtown! Elena and Piero will provide you with a city map as well as the best recommendations for lunch: there are several delicious and affordable local options to choose from. The tour concludes with us taking you back into Florence with our air-conditioned shuttle. You can just sit back and relax, while we navigate the road back to the city, where you will have time to tour the historic center or grab (another) gelato before dinner. For those who are concerned about not being in shape, or who haven’t saddled up on two wheels for a while we have an alternative so that they don’t have to sit on the sidelines for this beautiful experience. Euro 150 per person for min. 2 people. Distance traveled: about 10 miles/16 Kms. Starting point: from San Gimignano quick shuttle to the starting point of your tour/From Monteriggioni van transfer to Siena. Distance traveled: about 13 miles/21 Kms. Starting point: from San Gimignano quick shuttle to the starting point of your tour. Distance traveled: about 17 miles/28 Kms. San Gimignano to Siena Exceeded our expectations! Excellent tour of beautiful Tuscany! My partner and I did the full day San Gimignano to Siena bike tour yesterday with Elena and we had a great day! Elena picked us up near to where we are staying and she was wonderfully friendly and chatty, pointing out interesting things to us as we drove to pick up the other couple doing the tour. We drove to San Gimignano and reached it before the crowds - it is a beautiful old town on top of a hill with amazing views of the surrounding area. Elena also recommended a delicious gelato place to us 🙂 We then drove a little further and started the bike tour. The bikes were light weight and had lots of gear choices so riding them was very easy, there are also helmets provided. Elena drove ahead of us so we knew the route and we could catch up at our own pace. We were lucky to have beautiful sunshine and the scenery was very picturesque 🙂 I don't cycle a lot so I did struggle a bit with the hills - please be aware that as it is Tuscany there are some hills on the ride, but the hills are great as you get the best views on top and coming down. If the hills are too much you can always hop in the van with Elena for a while to rest 😉 We really enjoyed the stop at the wine tasting and the afternoon in Siena, Elena recommended a great place for lunch. We really enjoyed our day as we felt we saw some lovely little towns, amazing views and Tuscan countryside. Thank you!